Clement found faith in Christ either through St Peter or through St Paul. 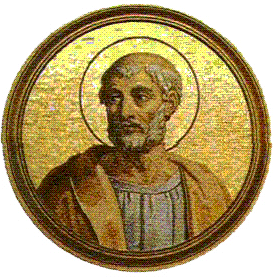 He was one of the Seventy Apostles and was consecrated as a bishop by St Peter. Clement is mentioned in Philippians 4:3. The Basilica of Saint Clement in Rome, one of the earliest parish churches in the city, is probably built on the site of Clement’s home. Clement is counted as the third bishop of Rome. His predecessors are Linus and Cletus, about whom almost nothing is known. Clement wrote a letter to the Corinthians, which was highly valued by the early church, and has been preserved to the present day. The letter is addressed from the congregation at Rome to the congregation at Corinth. Almighty God, who chose your servant Clement of Rome to recall the Church in Corinth to obedience and stability: Grant that your Church may be grounded and settled in your truth by the indwelling of the Holy Spirit, and may evermore be kept blameless in your service; through Jesus Christ our Lord, who lives and reigns with you and the Holy Spirit, one God, now and for ever.